Are you considering a move to the triangle? The Team That Cares would love to help you!! When Bud and Beth bought the property for B&B Country Garden Inn, it was their desire to open a bed and breakfast that could accommodate their relocating clients as a “home away from home” while they searched for their new home. 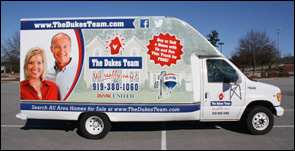 Clients John and Carrie Dukes from Florida were among the many that came and used Bud and Beth as their agents. But wait until you hear this……. 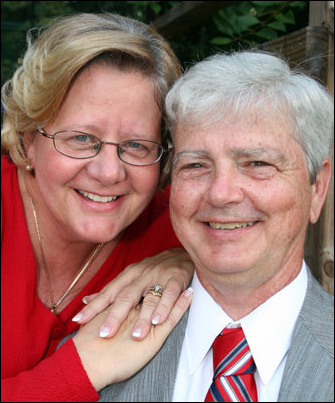 In 2012 Bud and Beth decided it was time for semi-retirement, they remembered how much they enjoyed working with John and Carrie Dukes. John and Carrie had continued in the triangle area with their real estate professions that they left behind in Florida. Well……we got together and decided we were a great fit to have the clients be serviced by this younger, very successful couple….we sold The Team That Cares to John and Carrie. Bud and Beth have stayed active with the TEAM and will continue to do so!! If you happen to see the truck below on our property, you will know that when you work with our team, the use of the truck is free. The names have changed but the service is the same. Wouldn’t it be great to discuss your home preferences (buying, selling, investing) over a delicious and relaxing gourmet breakfast prepared at the B&B? We do provide very informative relocation packets to our guests. 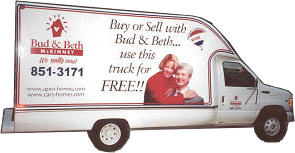 Just give us a call at 919-618-7653 or email us at beth@budnbeth.com.